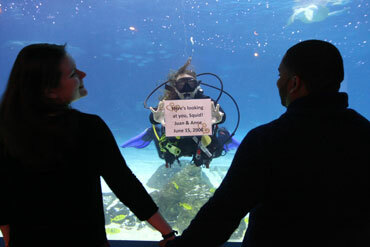 Let us be your one-stop Valentine Stop and treat your Valentine to a unique night of love beneath the waves! Join the Center for Aquatic Sciences at Adventure Aquarium for an intimate, adults-only evening at the aquarium and learn about the “Wet & Wild” mating habits of your favorite ocean animals. To register, click the button below, or email thatsamoray@aquaticsciences.org, or call 856-361-1025. This event makes a great gift for your Valentine! New this year – Get a free, downloadable gift certificate to present to your “otter”-half! All proceeds for this event benefit the Center for Aquatic Sciences. The mission of the Center for Aquatic Sciences at Adventure Aquarium is Education and Youth Development through promoting the understanding, appreciation, and protection of aquatic life and habitats. No refunds will be given for cancelations with 7 days prior to the event.